Nice to see this photo. I remember being very proud to say Carmen Taylor was my relation,she was very pretty! She was my grandmother,Edna Cook,s neice..Harry Cook my grandmothers husband had a dance band,my mother played piano,Eric Maloney,senior driver,instructor with Booth & Fisher played drums for a time.He also took coach tours as far as Switzerland. I was driving a coach in Switzerland when I last saw him (1966-67) I took my PSV driving lessons with B&F Eric was my instructor!.I was born 23 Station Road, in October 1944,in December a V1 Flying Bomb landed,(I believe 5 miles away) and I was showered with plaster.I could ramble on,sorry!!!! David, I am Carmen Taylor’s niece – her younger brother Ray’s daughter! I remember hearing about Aunty Edna and Uncle Harry when I was growing up. I’ve seen this photo before at my Grandma Nellie’s but I was really surprised to find it online! I hope you’re doing well, distance cousin! 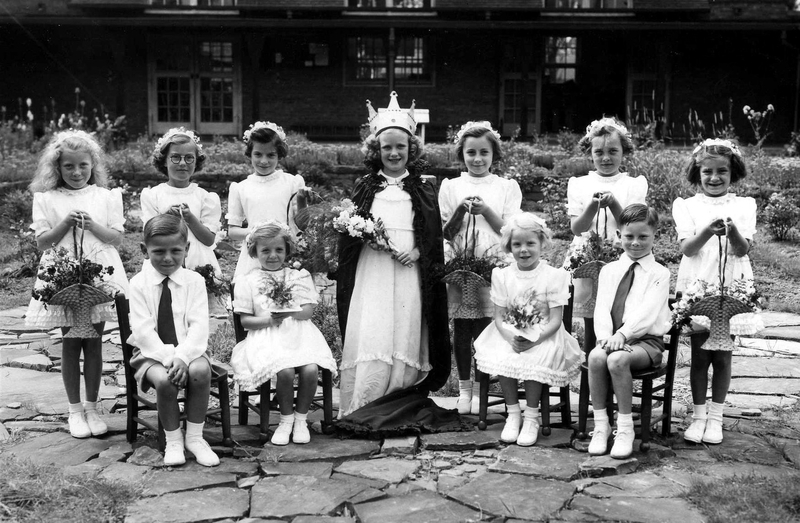 Killamarsh County Infants School ‘Queen’ Carmen Taylor, who was attended by Jean Walker, Betty Whitfield, Pauline Hoult, Jane Spooner, Wendy Goodwin, Jean Thornilow, Irene Goodwin and Linda Clarke, with Alan Wombell and David Drakett as page boys.